Renee: J and I bought Borderlands Christmas of 2009 (yes, folks 2009) and didn’t get further than a level 8 or 9 character I believe. So imagine my surprise when we got into Borderlands hot and heavy this past weekend. We played with two good friends that we raid with in WoW and finished the game in two days. And if you know anything about me, I don’t finish games. Staying up until 3:30 am did loads for my confidence that I’m not getting old. From midgets in refrigerators to riding across sandy dunes; This game has it all. I went for playing with an Xbox wired controller because it made strafing easier for me. J: When I found out that two of our friends were playing Borderlands I was so excited because as a group of friends we all tend to try to do stuff together. Knowing that we already had Borderlands I went to find our disk to install. Then come to find out they were playing all four of the DLCs which were ten bucks a piece. So it actually came out better to just buy the Game of the Year Edition to play with them. So after transferring my level 10 soldier over to my steam copy I was fired up and ready to play! It’s been a long time since I’ve finished a game outside of just at the arcade and beating Street Fighter 2 on one quarter. Renee: Street Fighter 2? You’re dating yourself, babe. I love how everything in the game (well almost everything) is about shooting. There are so many guns to choose from and you are constantly getting upgrades. I chose to go with a hunter and having the bird help you is a nice perk. I primarily tend to use revolvers and repeaters. It’s easy to change specs around and try something new if you wanted. J: The Co-op game is something I really enjoy. I love to play Co-op and I also love First Person Shooters (FPS) which was a good combo here. Being able to play with friends and family and enjoy the experiences together was a HUGE plus for me. I like how you’re able to help each other get caught up on quest and the creatures of Pandora get strong as you bring in more of your friends. I played a soldier and talented into Support which allowed my teammates to regenerate health if they are around me when I kill someone and also my turret had a healing regeneration buff as well. I really loved the fact that me killing would heal those around me. Renee: Oh yea, that turret came in handy. Let’s just say…errrr, I didn’t stay alive so well. All in all, I loved this game. I don’t know what took me so long to play it! I can blame it on WoW right? That always gets blamed for everything in the Valentine house. 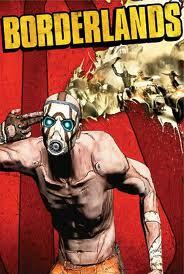 Woot Borderlands! That was some good stuff this weekend! When we gonna knock out Knoxx? Don’t you go finishin without me while I’m making the big move to Vegas! We can play Wednesday if you all aren’t busy with WoW! You better get settled in Vegas quick or I’ll start having withdrawals! You know we are down to knock out Knoxx and no way we are going to finish while you’re making the big move man! Wednesday does sound good! You should totally submit this review to Doghouse when we get our review site up and running! We could be like: What time is it, it’s Valen-TIME for a game review! Hey man we have no issue to link back to this 🙂 but that would be totally cool to do! Girl Talk: Talk To Me! Welcome to @Valentine!